A massive project like “India 2047”, is highly complex in the sense that it engages hundreds of functional units and local organisation, thousands of executives, associates and volunteers and millions of beneficiaries across the length and breadth of our nation. The idea is to promote the project as an open gallery of endless opportunities wherein all potential units of the community can come forward and contribute by leading or partnering with any element of the project. The complexity and diversity of various issues and problems that this project aims to address reiterate the need to have a scientifically organized and methodically addressed project plan. Various elements of the project have been thus defined and worked out as illustrated below. Vision : High level description about the destination OR Where we want to Reach. Mission : How we will reach the destination. 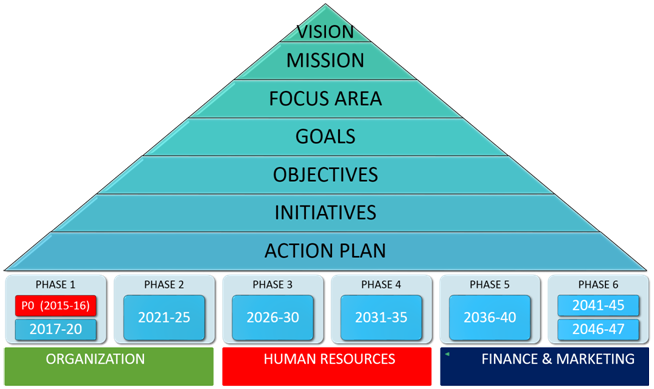 Focus Area : Key territory where we need to work on to support the vision and mission. Goal : The expected state of affairs with respect to a Focus Area by the dawn of 2047. Objectives : Expansion of goal or wish statements. In order to achieve the final goal of each Focus Area, we will have to complete several other sub-goals. Initiatives : Strategic Steps which are required to accomplish one or many objectives. It may be a mini or major project. Phase : Short-term duration within the entire timeline wherein significant changes or milestones will be achieved. Considering the seriousness and gravity of the issues, following sectors have been chosen as Focus Areas to work on. Their significance and priorities may differ from region to region. Objectives have been listed under respective Focus Areas. Initiatives have been listed under respective Focus Areas. Including the planning phase, the total project duration will be 33 years. The project timeline is divided into 6 phases of 5 years each. However, the first phase has 6 years including the initial year of planning and the last phase will have 7 years with additional 2 years for summing up.